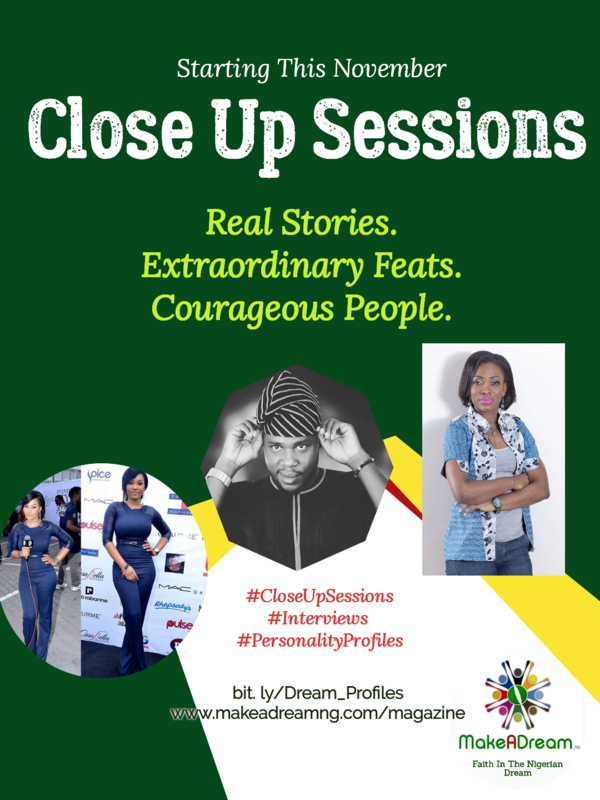 Introducing Our Close Up Sessions: Real Stories. Extraordinary Feats. Courageous People. So the recession is real and you think your dream is no longer possible? Well, there are hundreds of Nigerians still soaring in their chosen endeavors regardless. It’s been rough. It’s been tough. Yet today, they are still standing. So how do they survive? Therefore, from this November we live out this part of our dream (that’s basically why we are here) by telling you real stories of real people who are still living out their potentials regardless. You will learn from them. You will be encouraged. But above all, you will also learn their secrets; and you will be emboldened to work out your passion too. Afterall if they can why can’t you?!! We now present to you our Close Up Sessions. They are real stories of courageous people like YOU. They’re worth reading. They are up any moment from now. Please follow our blog and all our social media handles if you haven’t started so that you don’t miss a thing. It’s going to be a November to remember!!! Please Watch Out!!! Previous Previous post: And This Is How We Welcome You To November: Our Communication Lines Are Here!! !